A Thunderstorm, or Electrical Storm, is a weather formation where lightning and thunder are produced by a cumulonimbus cloud. During a thunderstorm you can also get heavy rain, wind and hail. 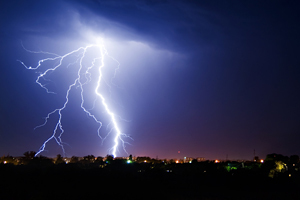 Thunderstorms are caused when moist, warm air rises from the Earth's surface. This moist, warm air cools as it rises and condenses to form clouds. If there is a lot of warm air rising, it can reach up to 12 miles (19 kilometers) high. Cool air moving downwards (known as a 'Downdraught') and warm air moving upwards (known as an 'Updraught') create the energy and electricity which produce the thunderstorms lightning and thunder. The average thunderstorm lasts for 30 minutes but can last for hours and be as large as 10km wide. Thunderstorms can happen anywhere where the right conditions are present. They are most likely to form during late spring and summer and typically happen between late afternoon and evening. If you see lightning you can tell how far away the Thunderstorm is from you by listening for thunder. By counting the number of seconds between the lighting and the thunder you can work out how far away the thunderstorm is. Remember, thunder is simply sound caused by the lightning. Lighting is one of the most spectacular results of a thunderstorm. Inside the cloud of a thunderstorm, a massive electrical charge forms. The positive charge is near the top of the cloud and the negative charge is sent to the bottom. Once the charge has built up enough inside the cloud, a lightning bolt is released from the cloud. This electrical discharge can jump from cloud to cloud as it heads towards the ground. Lightning can travel at speeds of up to 45 kilometres per second (100,000 miles per hour) and reach a temperature of 28,000 C (50,000 F).